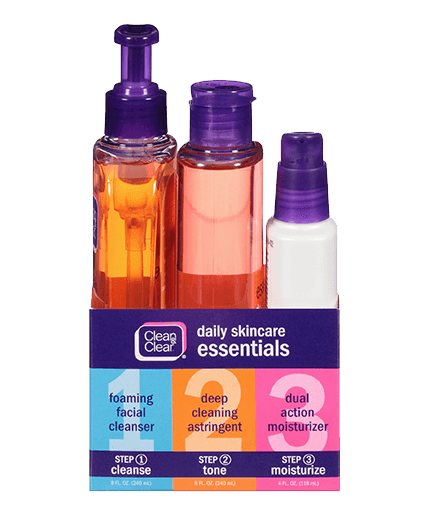 If all you want is clean, beautiful skin, then all you need is CLEAN & CLEAR ESSENTIALS®. Because taking good care of your skin should be a no-brainer. Work into a rich lather, and using your fingertips, massage cleanser over your face, avoiding the eye area but including the neck if desired. After cleansing, toning will remove any dirt left in your pores. Soak a cotton ball or pad with some astringent and wipe it over your face, focusing on the T-Zone area. Because this product can dry out your skin, start by using it just once a day. If all goes well gradually increase to 2-3 times a day if needed, or if recommended by your doctor. After you've cleaned your face and your pores, you're ready for the last step. This moisturizer has an acne-fighting medicine in it, so only apply a thin layer over the affected area. Do this once a day for the first few days, then gradually increase to 2-3 times a day if needed or recommended by your doctor. Water (eau), Triethanolamine, Myristic Acid, C9-15 Alkyl Phosphate, Lauric Acid, Glycerin, Hydroxypropyl Methylcellulose, Cocamidopropyl Betaine, Phenoxyethanol, Methylparaben, BHT, Propylparaben, Ethylparaben, Sodium Chloride, Tetrasodium EDTA, Red 4, Yellow 10, Parfum. Alcohol, Benzophenone-4, Denatonium Benzote, Dimethicone Propyl PG-Betaine, Isoceteth-20, Parfum, Red 4, Water (eau). Aluminum Starch Octenylsuccinate, BHT, Cetearyl Alcohol, Ceteth-10 Phosphate, Dicapryly Ether, Dicetyl Phosphate, Dimethicone, Disodium EDTA, Glycerin, Lecithin, Magnesium Aluminum Silicate, Menthy Lactate, Methyl Gluceth-20, Neopentyl Glycol Diethylhexanoate, Neopentyl Glycol Diisostearate, Parfum, Sodium Hydroxide, Steareth-2, Steareth-20, Water (eau), Xanthan Gum. Thanks for your review! We'd like to hear more about your experience while using our products. Please give us a call at 1-877-754-6411, M-F 9am to 5:30pm ET. We hope to speak with you soon! Cleared my skin right up! I like this product because it really works! I have sensitive skin so I only use it every other day. It has a burny/tingley feel when you use it. It really dries out your skin but it does really work!! Hey there, thanks for leaving your review! We'd love to chat more about how our Essentials Skin Care products are working for you, so please give us a call at 1-877-754-6411. We're available from 9AM - 5:30PM ET, Monday through Friday. Hope to hear from you soon! I’ve been using this set 1-2 times a day for 4 days and it’s amazing. My skin felt and looked so clean after using it. Even my friends saw a difference. I would highly recommend this set, it is amazing!! Hi there! It brightens our day to hear how well our Essentials Skincare Pack helped with your acne and blemishes! However, we wouldn’t expect the astringent to sting and we’d appreciate the opportunity to learn more about this. When you have a moment, please give us a call at 1-877-754-6411 between the hours of 9:00 AM – 5:30 PM ET, Monday – Friday. We hope to hear back soon! Thanks for taking the time to leave this review! We're happy to hear you enjoyed the cleanser and moisturizer, but sorry to hear about the stinging you felt while using the toner. We'd like to learn more about your experience with these products and how you used them. Please give us a call at 1-877-754-6411, Monday-Friday between 9A-5:30P ET. We look forward to chatting! I find this to be gentle on my skin and love the value of being able to buy it in a pack. I have been using this combo pack for a few years, and now my teenage sons use it as well. The gel cleanser foams up beautifully and leaves your skin feeling cool and fresh. The astringent is a must have to remove any traces of left over dirt. Finish off with the best acne moisturizer out there. No greasy, heavy feeling at all. Your skin will feel soft and lush. A great cleaning essential pack. Go for it!